Includes 4 adjustable spill-proof glass shelves, 5 adjustable door bins, snack drawers and more to provide ample space for storing items. Click the button below to add the GE - Profile Series 24.3 CuGE - Profile Series 24.3 Cu. 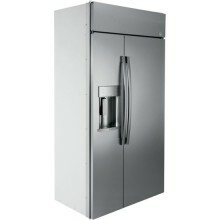 Ft. Side-by-Side Built-In Refrigerator - Stainless steel. Ft. Side-by-Side Built-In Refrigerator - Stainless steel to your wish list.